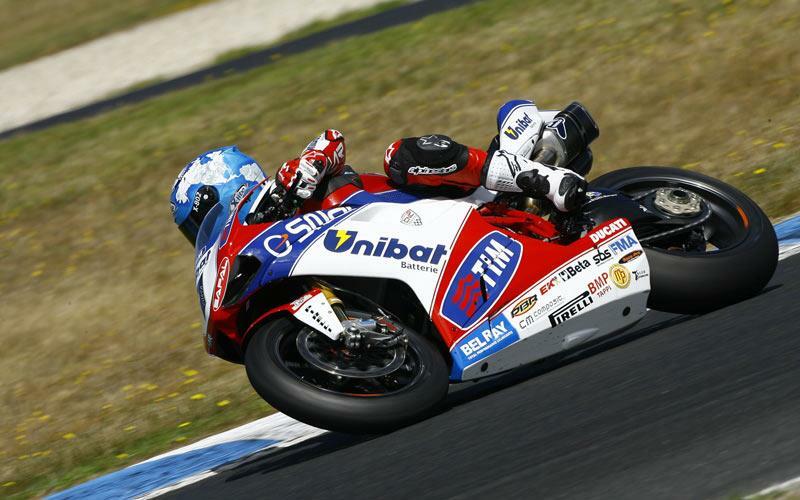 Reigning World Superbike champion Carlos Checa picked up where he left off by finishing the three day test in Phillip Island at the top of the time sheets. The 39 year old set a best time of 1.31.8s on the final day of the test despite scorching 54 degree track temperatures. Checa was also riding with an additional 6kg’s of weight on his bike following new technical regulations for the 2012 season. He said: “We lost time yesterday because I was unwell; I stayed in bed for most of the morning and only went out on track from about 2.30pm. Despite that setback, we still got most of the work done luckily. "Today was even hotter and we tried different things but it seems hard to make further improvements when we already feel like we’re at the limit. We started the season well here last year so we’ve compared last year’s set-up to this year’s, considering the extra 6kg, and we understand the direction to take. Tom Sykes continued to show he has the pace to be at the very front of WSB this year and after pushing Checa all the way ended the third day with a best time of 1.31.9s. BMW Motorrad rider Leon Haslam was also in positive mood after a successful three day test which saw him end up third fastest on the time sheets, 0.4s slower than Checa. Haslam said: “The test has been good and really quite positive. We came here with the base set-up of our new bike from Valencia, and it worked pretty much straight away. "Over the three days we had time to figure out the base set-up of the new bike, and to find the settings for this specific track. Of course it is important to go fast around here, but it is also about exploring a little bit so you can make big steps in both directions to be able to understand what the bike is doing. Crescent Fixi Suzuki rider Leon Camier had a more positive day after the team were able to iron out some of the problems that affected him during the opening two days of testing. The 25 year old ended the test in tenth place with a best lap of 1.33.1s. He said: “We had a few electrical issues on the second day, but resolved them in time for the last day, which was the first time we’ve been able to make many changes we wanted to do and I’m happy because we were able to progress a lot. Factory Aprilia rider Eugene Laverty suffered a major setback after crashing his RSV4 at the fast turn one on the final day of the test. The Irishman suffered a broken third metacarpal and is reported to be heading back to the UK for surgery before returning to Australia in time for the opening race of the season on 24th to 26th February. Laverty’s crash followed John Hopkins fall on day one which has ruled him out of the race. Other riders to crash during the test included BMW’s Marco Melandri, Suzuki stand in rider Josh Brookes and Checa’s team-mate David Giugliano. Lap times from day three. 1. Carlos Checa (Ducati) 1'31.8; 2. 2. Tom Sykes (Kawasaki) 1'31.9; 3.